Dieter: OK, so thickness does include the notion of influence but more so the notion of strength or abscence of defects. I also believe that it is OK to make territory in the vicinity of influence, but not in the vicinity of thickness. I will reopen the debates about thickness through a few examples. The following pages have a lot of duplicate information scattered around. It seems as if everybody passing SL was unhappy with the information stored and started his own page. --Stefan: Even after the WikiMasterEdit, I feel we should reopen this page for discussion to include the thought provoking thickness concepts currently discussed on rgg. For those who missed the article, it started with a John Fairbairn message on December 9, 2001. What we knew (or rather , "were told", let's remain modest ;-) is that atsumi is for attacking, not fencing off territory. We were also taught that the objective of attacking can be killing groups (the objective most of us figure out by ourselves), but more commonly also making territory, gaining further atsumi, or something else that puts us ahead from a point of view of the balance of power and the balance of territory. Now from the above it seems that either: - there is another process than attacking to convert your atsumi in go, which could lead us to new ideas to plan our games; or - the attacking process is largely the same, but it is executed with another objective in mind than the usual ones I heard before. LoP: I found following analogy quite useful. Thick play is comparable to an especially thick Sumo ringer. While he might be a little slower than his thinner opponents he is also stronger and harder to attack. He can defeat his opponent with direct force. One possible counter-strategy is a fast paced, evading style. -- TakeNGive: I think it was a copy-n-paste problem -- paragraphs were turned into "preformat" text. I couldn't stand it, so I made it into a "term:definition" list that looks kinda like "blockquote." I hope that's okay. intro to Part 2 of The Book. Bob McGuigan: This link, and also the earlier one, to messages posted on rgg by John Fairbairn doesn't work. I am connected to google groups but all I get is a blank page. Bill: Dieter, you have bitten off a big job. Pages here related to thickness have both redundancy and inconsistency. One thing about unification: there are diverse points of view expressed here. I do not think we have a received concept. For instance, strength certainly suggests absence of defects, but look at Thickness Example 6. Those three stones certainly have defects and are potentially vulnerable, yet Fujisawa regards them as thickness. John F. Bill, my instant reaction to that was "what defects? ", and I was also a bit dubious about potential vulnerability (in other words, I too regard it as thick). But then I had another thought: check the database. I found 147 examples, and then looked more closely at a sample of 20 or so. The results rather surprised me. Yes, they confirmed my view that there are no defects, and yes, the group was not vulnerable in the sense that it never died. But only in one case was there a territory of more than a tiny handful of points eventually associated with it, which seems to suggest that what strength it does have is nothing to do with simplistic concepts like using it to attack to make territory. In every case it looked incredibly difficult to use, seeming to get involved in complex centre fights 9 times out of 10. So while I might delude myself on the surface that I understood this position, in truth I wouldn't have a clue how to use it myself. At a cynical amateur level, I'd even say it would be a good idea to play san-san a lot and let your fellow amas (mis-)handle this hot potato. Dieter: In that example too I think there is more lasting strength? and influence than local strength?. Bill: Well, John, I regard it as thickness, too. 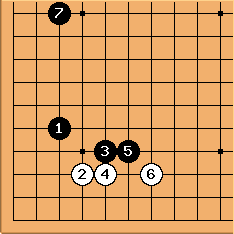 :-) Perhaps I have been influenced by seeing Sakata attack such a formation and make it heavy. In some variations, as I recall, it seemed like sacrificing the two stones on the 4-4 and 5-4 points was a viable option. In others, the threat to cut them off had to be answered. Both possibilities indicate a defect to me. John F. I agree with the propensity towards heaviness, Bill. I presume that's implicit in many early thick shapes. I'm not sure, though, that I'd call an answerable threat a defect. To me, a defect implies something like a genuine cutting point. Likewise, having an option to sacrifice sounds more like a positive thing to me. Indeed, is good go not all about creating options? Historically, thickness in English has meant atsumi. Atsui is more general. Maybe we should have two pages, Atsusa and Atsumi, with Atsui an alias to Atsusa. So far, the single example is rather local. But the thick play does not make astumi. I will keep an eye out for thick or thickness with a global, long range meaning. Maybe worth keeping, with introductory material aimed at beginners. Hmmm. I took another look. The material there is unusual, since anonymous thinks that the problem is playing thickly. Has some pedagogical value, no? Tamsin's views, I think, with some discussion. Has pedagogical value, no? Maybe Tamsin's pages could be in their own group. can also be at the marked point. In this position the positions of both sides are thick. If is omitted the three outside stones are not thick. Is this outside shape thick or thin, the book asks? It says one point of view is that it is thick because it does not fear attack. It has a cutting point a but a cut leads to the outside player making a wall (this seems to be the only time wall is used in the book!). Dieter: The book may call this thick, but I consider this position to have much rather influence than strength. anon: The book would seem to be using a touch of hyperbole to emphasize the point. White's stones are "thick" in sense of thickness that a) you don't have to worry about these stones and b) you can do something useful with them if your opponent approaches them. Black can attack this way. Black's attack really comes forward if he has a stone at a to prevent White's b. With Black a, is White still thick? as a kakari seems not so bad, but what is black trying to accomplish here? 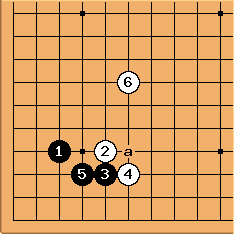 By strengthening white he weakens the left side and corner. Black can't be trying for a position on the right since he would then have pincered white in the initial joseki if that was his intent. seems heavy here. Black's attack would certainly be better with a free extra stone added at a, but this is wishful thinking. The outside position is thick. However, it is the group as a whole that is thick. Take away the stone and the wall left is not thick. 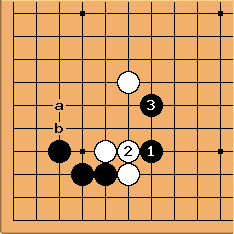 Furthermore, if White now plays a (a "thick move"), the black outside position is no longer thick. If White plays not a but and so on to , White's position is not thick because of the defect at b.
Dieter: Thanks Bill. Thinking of Charles' articulation problem, I really think we have to get away from Japanese terminology because as long as we will have those as reference points, linguistic arguments will continue to blur the understanding on what's behind, namely these difficult concepts of strength and influence. I would prefer to have pages such as local strength?, influence, strong influence?, lasting strength? etcetera, find good examples for these and then keep atsumi, atsui and atsusa as merely linguistic pages referring to the Western concepts, articulated in English. A one-to-one translation of the concepts does not (yet) seem to have been found. I have been advocating against the usage of English terms first, but now I think that translations of English into other European languages will be easier to fit 1-1. 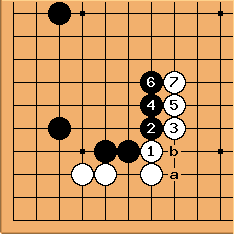 The key argument for me to do this, is that one of the most important proverbs in Go, play away from thickness is so difficult to understand and so easy to misinterpret as play away from influence, as long as we keep mixing these up and be distracted by the atsui/atsusa discussions (as interesting as John's contributions are). Bill: I am not really an advocate of preferring the Japanese terms over the English ones, here. Thick, thin, heavy, and light are all metaphorical, and, as metaphors, the English terms are good enough, IMO. The main problem I see is having two terms, atsumi and atsusa in Japanese, each of which has a natural translation as thickness. I am happy to leave atsui or thick as one page, with it as the more general term, associated with atsusa, and atsumi or thickness as another, emphasizing the more narrow usage. Take the example on Thick play examples. While I appreciate the play, I would not have immediately thought of it as thick. That example has helped me to understand the concept better. Would it really be better to try to place it in some new, poorly understood Western conceptual framework, of uncertain significance, worked out by amateurs? Bill: Proposal for Thickness and Thick pages. 1) The quality or property of being Thick. 2) A strong formation of stones, typically exerting outward influence. Atsumi. Thickness is a high level go concept. Utilizing thickness is an important skill. Here are links to pages about thickness. There are thick stones, thick plays, thick styles of play, thick territories. A player's whole board position may be thick overall. It is better to be thick than thin. It is better to be thick than heavy. Learning to distinguish thick play from heavy play is very important to one's go progress. A player with a thick overall position typically has an advantage in terms of fighting and ko threats. This overall thickness enables her to play enterprisingly. Even if fights or ko fights do not develop, their threat to do so can be effective. Notes: Unless the meaning of thick as being ahead in territory already exists in the English go literature, I do not propose to include in on the thick page. 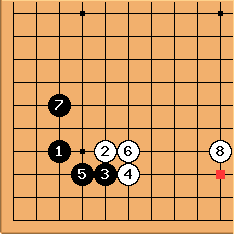 Reason: It is not a high level go concept. Learning it will not make someone a better player. OC, if you are reading Japanese go literature, you have to be aware of that meaning of atsui. For that reason, I do not think that atsui should be an alias of thick. I also do not think that atsumi should be an alias of thickness, because it is only one of the meanings of the term. I think that we can deal with atsusa as a term separately, rather than having it be an alias for thickness. The text on these pages might be more extensive. However, I think it better to keep them short, leaving further exposition to other pages. Dieter: I think this proposal is at least much much better than what we have now. Maybe in the future we will unalias more Japanese Terms. Bob Myers: Some commentaries I'm reading now repeatedly mention that a position is thick because of forcing moves that are available. This would seem to be a slightly more nuanced way of thinking about being thick--you can be thick by having (or ending up with, or setting up) forcing moves for when you need them. Gresil: The parent page states that Chinese thickness theory is based on "shi". Shi is...? RobertJasiek: "More liberties" is not an indication of "greater thickness". The left black group has 12 liberties and is thicker than the right black group with its 15 liberties. Herman: Would you say that, on average, a group with more liberties is more likely to have greater thickness? RobertJasiek: I do not know. As a player, I do not care, because such a consideration would require by far too great calculation effort. Instead, it suffices to determine or estimate degrees of connection and life, because 0, 1, 2+ or * (for "infinite") are the only numbers needed for thickness - simple! The left group is *-connected and *-alive; the right group is *-connected and 2+ - alive. Dieter: If we're looking for clear heuristics for thickness, then eyes, connection and liberties are good candidates, in decreasing order. Two groups with the same eye potential and connectivity but with different number of liberties, will differ in thickness, though not as much as two groups with same number of liberties but different eye potential or connectivity. So, I would keep the criterium of liberties but point out its diminishing return. Robert seems to question whether they matter at all (for thickness). Dieter: So your answer is rather "yes, number of liberties play no role in thickness"
tapir: This one: "In meaning (2), the group would be considered thick in proportion to the usefulness of these features. For example, having an additional eye over adjacent groups may be highly prized. Or if close fighting is expected, number of liberties may be key." is the specialized comparison meaning. Nobody actually claims on the main page that liberties are an ingredient of thickness (1). It says: "well connected, good life potential, good territory potential." - what Robert edited was the potential results of thickness (1). Is it really controversial? Imo, in close fighting you are naturally looking at the number of liberties etc., but the concept of thickness as comparison between groups is as far as I can tell applied in the calm moments where you make strategic decisions not the close fighting in between. Or to put it otherwise, you need the heuristics for the strategic decisions but close fighting should rely more on reading, right?